NGC 7635, also called the Bubble Nebula, is a H II region nebula in the constellation Cassiopeia. It lies close to the direction of the open cluster Messier 52. The "bubble" is created by the stellar wind from a massive hot, 8.7 magnitude young central star. The nebula is near a giant molecular cloud which contains the expansion of the bubble nebula while itself being excited by the hot central star, causing it to glow. It was discovered in 1787 by Friedrich Wilhelm Herschel. 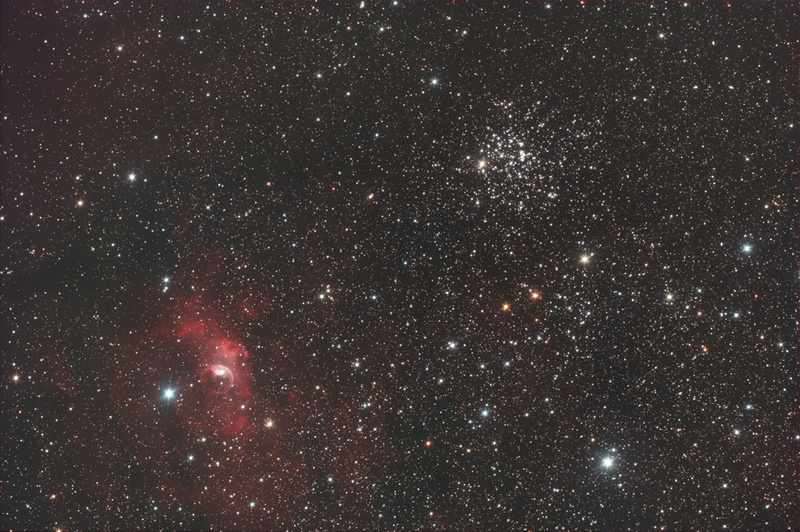 This is the last test image with the Deltagraph before my next astro holidays in Italy. gradients had to be treated with GXT.